Here are some examples of my work, each a collaboration with a bride who will always have her dress to cherish and perhaps pass on. Gown of imported French re-embroidered Alencon lace. The lace is hand-pieced to eliminate seams, allowing the floral pattern to continue uninterrupted. The gown is fitted through the hips and then trumpets to a cathedral train. 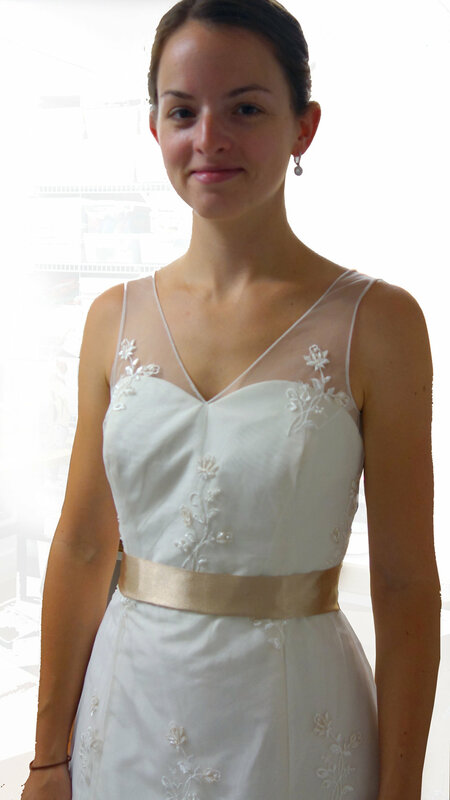 The bride wears a bias cut slip of silk charmeuse, cut low in back, with miniscule straps. The peach silk underneath warms up the white of the lace. Alencon lace is hand-pieced; no seams interrupt the pattern of the lace. White Silk Taffeta Civil War Reproduction Wedding Dress with an authentic period corset built in. Laced back, off the shoulder, with puffed sleeves. Delicate lace trim. The dress is based on a gown in Janet Arnold's book, Patterns of Fashion 2. The bride and groom are both Civil War re-enactors and many of their friends also wore period clothing to the ceremony. A Civil War re-enactor, the bride was comfortable and at ease in her period pettiocoats and corset. A corset bodice that closes with lacing and fabrics appropriate to the 1860s - silk taffeta , silk llusion, and cotton French Valenciennes lace trim. Closeup of period details on the Civil War gown's bodice. Bodice is constructed as it would have been in the 1860s, an authentic pattern was adapted to a modern figure. Fashion-forward Nicola chose a subtle silver charmeuse for her wedding gown. Two layers of this luxurious French silk hug the bride's curves. The subtle shade of silver glowed on a rainy day. The gown, with a deep v-neck in front and cut to the waist in back, has thin straps which cross in the back. The chapel train bustles easily without interrupting the columnar silhouette. This dress complements the bride without competing. 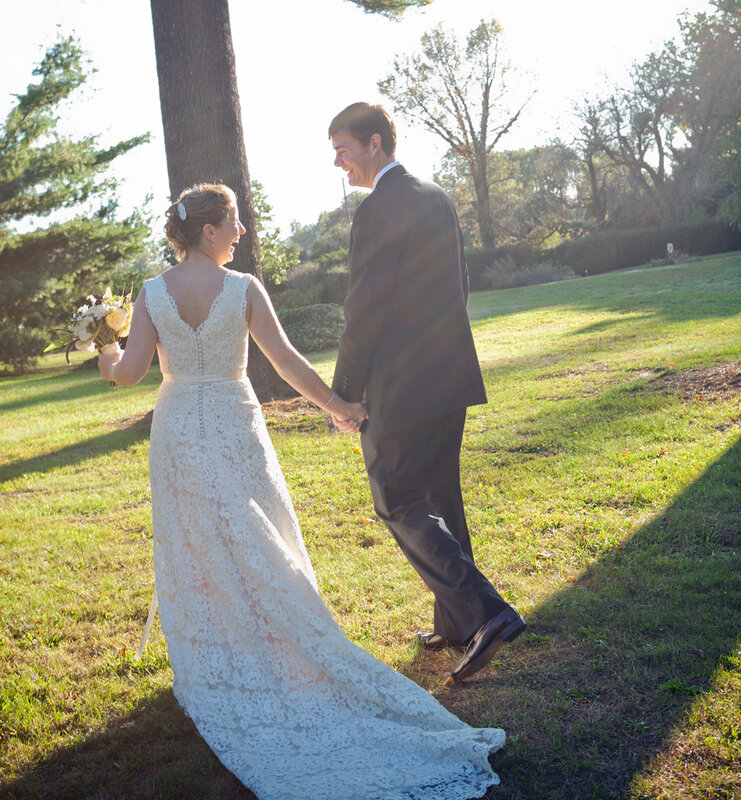 The soft color heightens the bride's glow. A Halter neckline and high waist top a body conscious gown. The low-backed halter top gown has narrow straps that cross in back and secure at the bride's waist. Loretta's gown features a playful skirt made from sixty yards of soft silk organza. The fabric is weightless and flows effortlessly with the bride. The cathedral train hooks up to the waist, adding layers to the skirt for the reception. The bodice is French Alencon lace, hand-pieced so there are no visible seams. 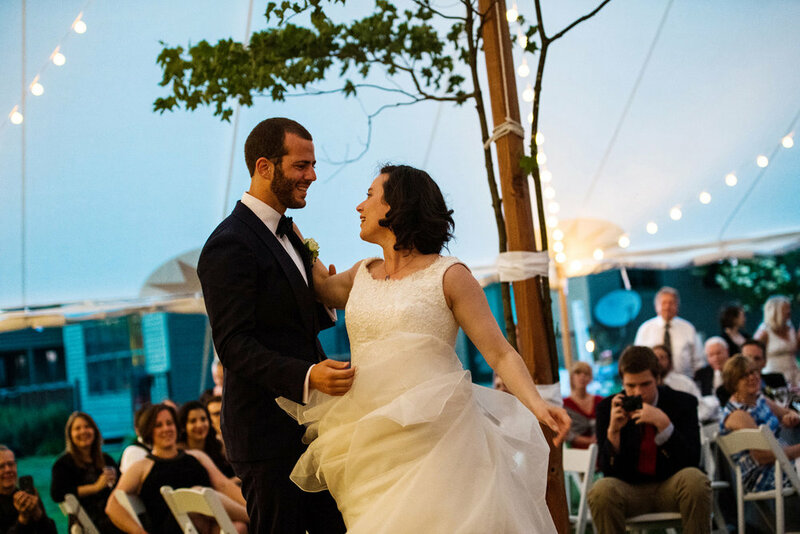 Weightless silk organza came alive when Loretta twirled. She spent time in fittings seeing what she could make the dress do. Three subtle colors of silk organza, in satin and matte, give texture and depth to the skirt. Circular spirals of organza in four different lengths build up layers - no scratchy netting in this gown! Diana drew a sketch of exactly what she wanted in a gown. I merely executed the design. We sourced the lace together, tulle with delicate embroidery and tiny pearls - just enough to make it special without glaring in the sun. A taffeta underdress give the A-line gown its shape and the chapel length train bustles up easily. 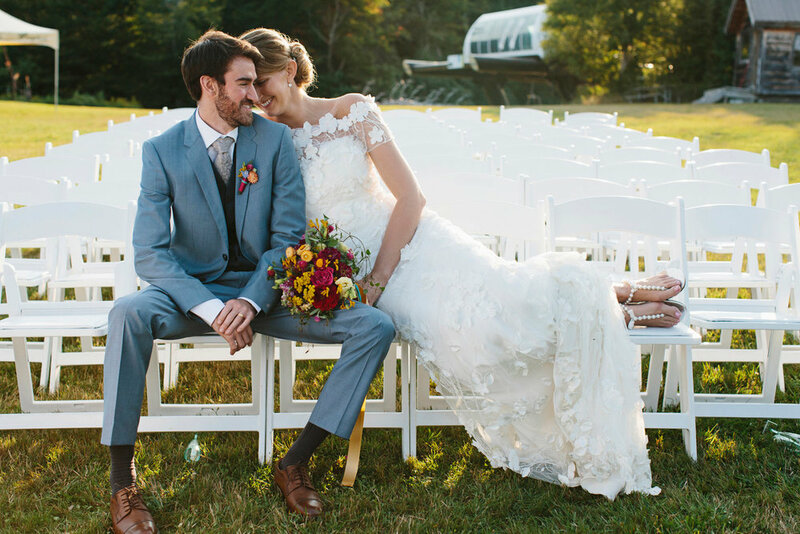 This subtle dress was perfect for an outdoor wedding in Vermont. Alencon lace imported from France and a silk taffeta slip to add body to the gown. The lace is hand-pieced to eliminate seams, allowing the floral pattern to continue uninterrupted. 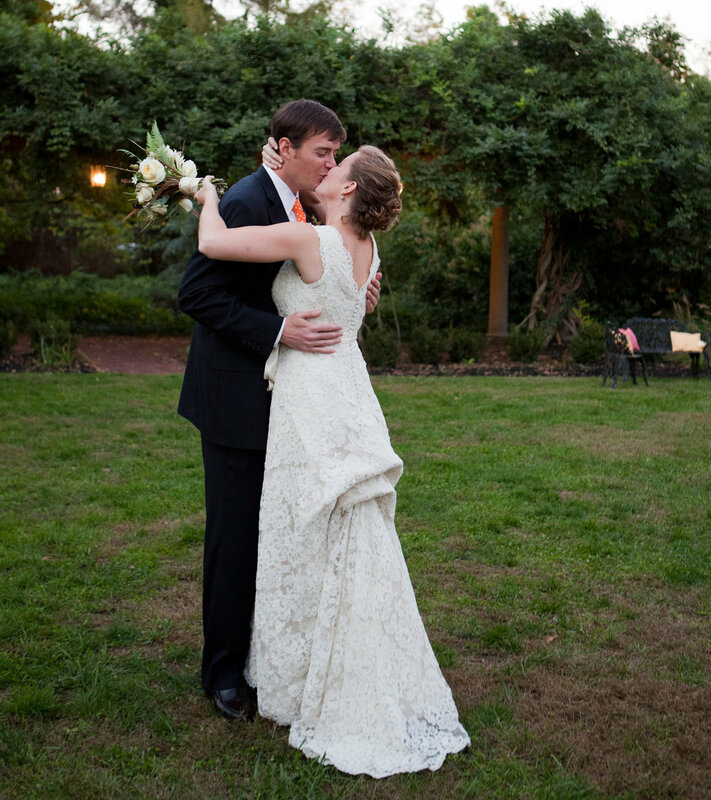 This bride chose a sweetheart neckline. The A-line skirt extends to a cathedral train which bustles up for the reception. The ivory slip makes the pattern of the lace stand out and the light sash echoes the color of the slip. Just two tucks bustle up the light weight lace train for the wedding reception. A-line skirt swoops to a full cathedral train. Formal portrait of a classic gown - buttons and loops, fitted bodice, cathedral train with scalloped border. The large scale of the Alencon lace pattern works well with the long full skirt. 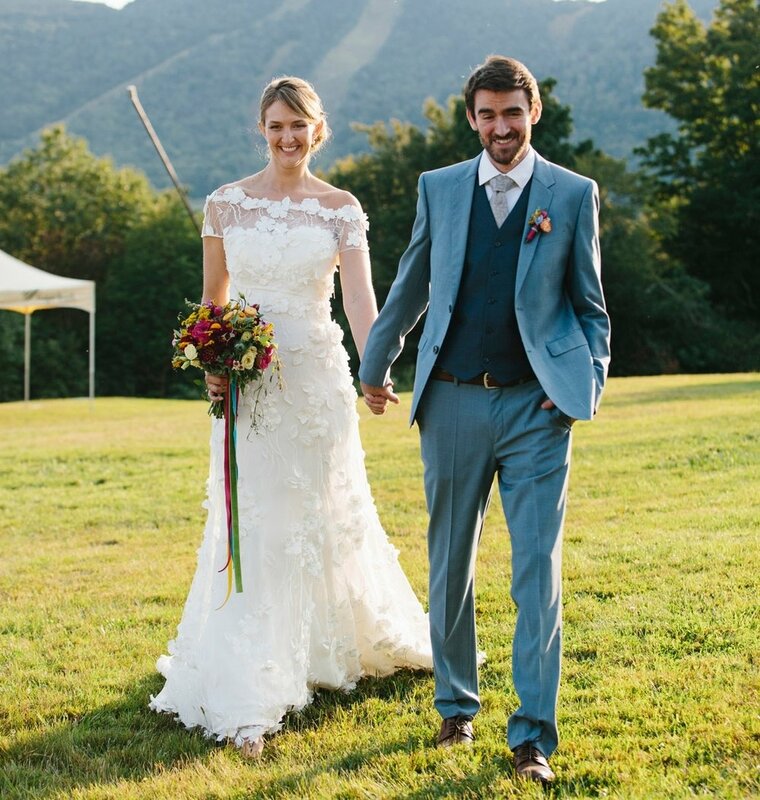 Alison's Guipure lace gown has a pattern of leaves, perfect for a late summer Vermont wedding. The lace is hand-pieced so there are no visible seams on the dress. The strapless gown has a crimson sash which ties in back and falls the full length of the chapel train. The sash matches the bride's shoes and the couple's car. We considered a red lining, but it detracted from the lace, while the pink makes the lace pattern pop. Closeup of Guipure lace with leaf pattern . Alison's flowers pick up the warm tone of her slip and the red of her sash. Note the heavy drape of the Guipure lace trumpet skirt. The red of Alison's sash (and car) stood out beautifully against the autumn foliage. Krisztina chose to have her wedding outfit made in three pieces. The Alencon lace jacket made her feel like a bride and she can wear the satin bustier and chiffon full skirt over again when she performs as a violinist The lace and chiffon worked well to complement Krisztina's diminutive figure. And silk chiffon is lovely for an outdoor ceremony, fluttering if there's a breeze and not glaring in the sun. Silk corselet of duchesse satin can be worn again - with a black skirt to a recital, with a short skirt to a party, or with skinny jeans just for fun. The three pieces together, time to check in the mirror. Krisztina removed her jacket to dance. The lowered shoulders limit arm movement, something we discussed early on. It gave her an excuse to show off the satin top! 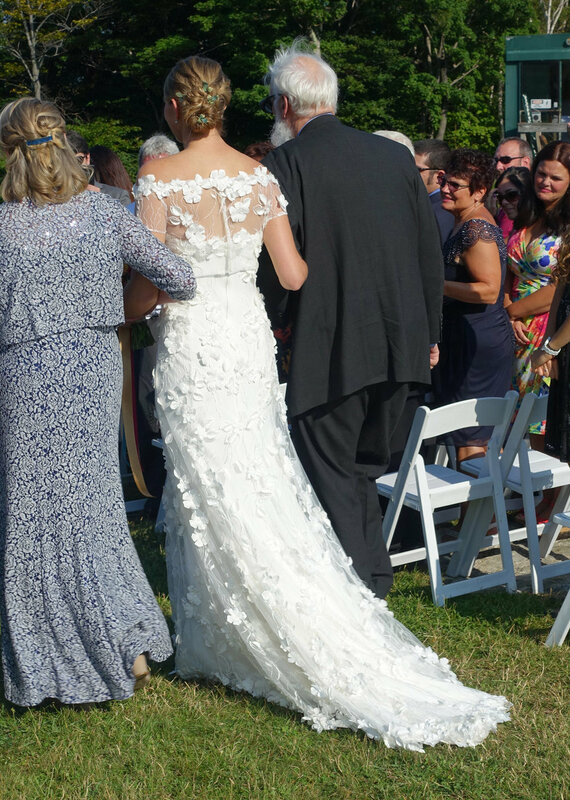 We chose a delicate Alencon lace pattern to complement Krisztina's slight build. Soft silk chiffon skirt, 15 yards in two slightly different tones, drapes as no other fabric can. Let's chat and see what we can create together.